Our SN check list included mild and/or a correctable heart condition. 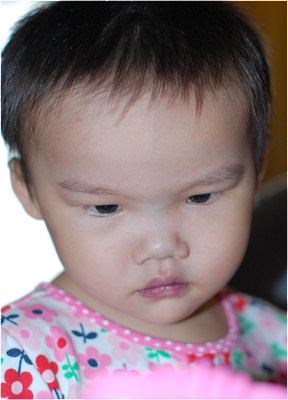 35 months after our log-in-date we received a phone call from our agency about a little girl who had recently turned 2 and had a VSD. They wanted to know if we would be interested in reviewing her file? By all means… YES we would. Less than five minutes later we were looking at pictures of an adorable little girl standing in a metal crib. I could just picture myself being her mommy. We began to pour over her Chinese file, I read words I had no idea what they meant, she had more than a VSD, this I knew. My husband got on the phone and called two different pediatric cardiologists. We felt blessed that both offices agreed to review her medical file that day. We immediately e-mailed both offices her medical file, on a Friday afternoon! Not one, but both doctors called us back that day. 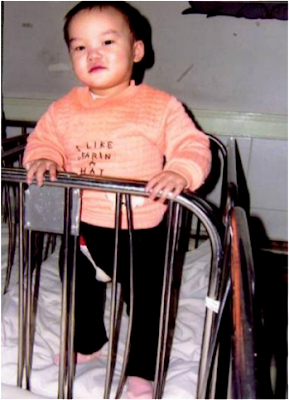 The first doctor explained her condition to us, and my husband was set, this was our daughter. I was more hesitant; I wanted to hear from the second doctor. Her condition was serious, I could not imagine falling in love with this baby and having her life cut short because of her heart condition. The second doctor mimicked the exact same diagnosis and what was needed to repair her heart. 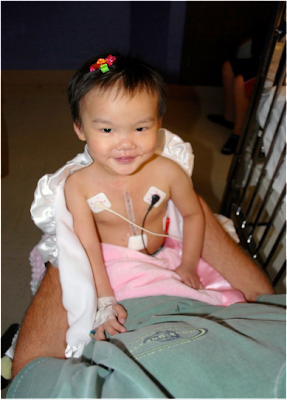 Both Doctors told us that she would need open heart surgery, but that she would live an active, normal life. 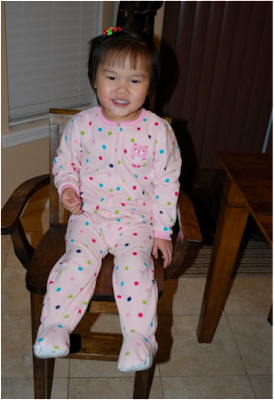 We accepted the referral of our daughter that evening, whom we have named Jadyn Qi. My husband and I both would stay up late on the internet reading about her condition, this went on for weeks. We became somewhat of experts. I knew medical words and names of procedures, I had never heard of in my life time. 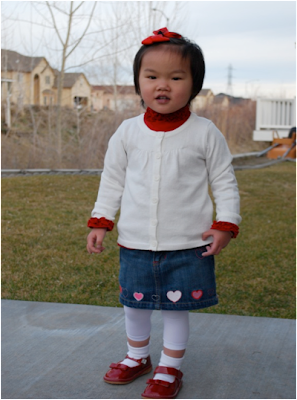 Jadyn has Transposition of the Great Arteries (TGA), Pulmonary Stenosis, and a very large VSD. The last two conditions actually saved her life, as TGA alone is fatal. Nine weeks after accepting her referral, Jadyn was in our arms. After many tests and a echo of her heart it was found that her VSD could not be closed due to the size, it was too large to patch. Her doctors decided that she would have the Glenn & Fontan procedure. Home from China only 2 weeks, Jadyn had open heart surgery. Jadyn was in the hospital for only 72 hours after having open heart surgery. Her nurse had to talk me into taking her home… I just couldn’t believe she was ready to be discharged. Our girl is a trooper. Just six weeks after surgery, her cardiologists told me “I’ll see her in six months.” Six months? Are you kidding me? Jadyn is on a half a baby aspirin per day, no other medications or restrictions. Once she reaches 35 pounds she will have her final heart procedure, called Fontan. She has been home now for six months and has blossomed more than we could have ever imagined. Jadyn has gained seven pounds and grown over 2”. She has learned to run, to climb stairs, She is fully potty trained, can count to 20 and knows well over 100 English words. Jadyn gets winded when she runs or plays hard, this will be corrected with her next surgery. Before her Glenn procedure her oxygen saturation level was in the 70’s and even lower when she would cry, it is currently in the mid 80’s. She is projected to be within normal range of mid to high 90’s after her next surgery. We love this little girl so much. You can read about our journey to Jadyn here. Please feel free to email me with any questions you may have regarding our experience adopting a special heart baby.